Little Luna Lake Is A Beauty � With Trout! Photo by George Andrejko, Arizona Game and Fish Department. boat and troll, as long as your motor isn't over 8 horsepower. Luna Lake is a dynamite little trout fishery near the eastern border of Arizona, just past Alpine. Rainbows, brookies, and an occasional cutthroat keep anglers busy at Luna Lake, and you can even take a boat and troll, as long as your motor isn�t over 8 horsepower. The trout at Luna have a taste for Power Bait and salmon eggs. You can also try worms or lures like Z-rays and spinners. Live bait fish are a no-no at Luna. Ultra-light tackle is your best bet. Most of the trout are little stockers, but an occasional hold-over from previous years keeps things interesting. Fly fishermen might want to try some black and red wooly buggers (#6 hook), black gnats (#10 or 12), and Pistol Petes (these are flies with little spinners on them). By mid-summer the lake may be getting low, since it is used for irrigation, so you may want to call ahead and find out about launching and fishing conditions. Luna Lake isn�t big�only about 120 acres when it is full, but it is beautiful. At an elevation of almost 7,900 feet, it is surrounded by fabulous forest. Bring warm clothes � it can get chilly at night that high up. There is a 51-site campground at the lake, and single spaces go for $10 per night. There are 21 sites with RV pull-throughs. Group sites (there are three) go for $30 per night. The campgrounds have tables, fireplaces, restrooms, and a recycle center. Electricity and water are also available. The campground has a main loop and a west loop, which includes two group sites. Some of the sites overlook the lake. Things to do or see nearby include the Coronado Trail Scenic Byway (US 91), Hannagon Meadows, petroglyphs along the Blue River, the Blue Range Primitive Area, and the Escudilla Wilderness. The parking aprons are dirt and gravel, and some RV pull-throughs can accommodate two RVs. There is a waste station in the Alpine Village RV park on Route 180 in Alpine, and the fee there is $5. There is a waterfowl refuge on the lake, and abundant opportunities for bird watching all around. Hiking and biking trails make it easy to get around. The Luna Lake Loop Trail, for hikers, bikers, and horses offers an 8-mile upper loop and a 2.5-mile lower loop. The upper loop isn�t very well marked. Some areas may be closed at certain times of the year to protect nesting eagles. The closed areas will be very clearly marked; you may be able to see a nest from the parking lot, though. You can rent a boat or bring your own, and the store near the lake stocks candy and other quick fixes, as well as bait and firewood. If you don�t find what you need there, Alpine is only three miles up the road, and they have a market and a tackle shop. The Apache-Sitgreaves Ranger Station can be reached at (928) 339-4384 or (928) 333-4301. The number for the Arizona Game and Fish Department in that area is (928) 367-4281. You can get fishing reports at www.azgfd.com.http://www.gf.state.az.us. To get to Luna Lake, just take Highway 180 southeast from Springerville to the lake. Or, take 191 from just east of Safford north to 180. The road is clearly marked, and it is paved all the way to the lake. 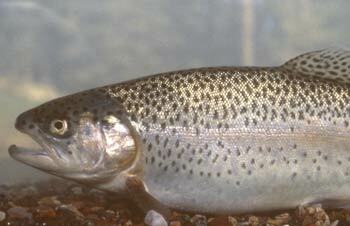 Don�t forget your Power Bait and salmon eggs and that the Luna Lake trout seem to prefer bright colors.